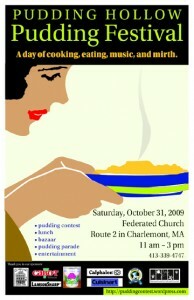 As many readers know, one of my favorite fall activities is the Pudding Hollow Pudding Festival. This yearly homage to small-town life and food blends many of my passions–food, music, humor, and hammy acting. The poster above (designed by Leon Peters of Massachusetts College of Liberal Arts–thanks, Lee!) should give you some idea of the colorful yet homey nature of this event. This year’s festival will take place on Saturday, October 31 (yes, Halloween! ), at the Federated Church on Route 2 in Charlemont, Massachusetts. Entries to the contest portion of the day are due by 11 am that morning so PLEASE START THINKING ABOUT MAKING A PUDDING. And tell your friends about this event. If you enter, you will have fun, contribute to a great cause (the $12 entry fee goes to our historical-society building project), and probably get at least a very small prize (we have quite a few!). Entries need not be elaborate. 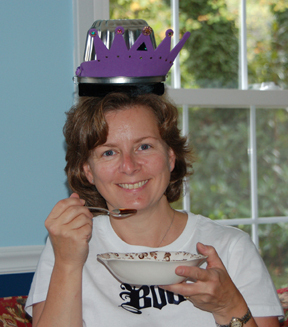 As you can see from our contest information pages, our definition of the word “pudding” is highly flexible. Non-cooks may shop, eat a yummy lunch, and watch the free fabulous entertainment. We’ll get everyone home in time for trick-or-treating! If you have questions about the day or if you’d like to volunteer to help, please use the contact form on this blog to get in touch with me, Tinky. The contest web site includes a list of prizes and pictures of last year’s festivities. Preheat the oven to 350 degrees. Into a bowl sift 3/4 cup of the sugar with the flour, baking powder, and salt. Beat in the milk, vanilla, and peppermint extract. Melt the chocolate and butter together in a double boiler. Add them to the other mixture. Pour this batter into a greased small 1-1/2- to 2-quart casserole dish. Blend the brown sugar, the remaining white sugar, and the cocoa, and sprinkle them on top of the batter. Pour the water over all. Bake for 40 minutes. Serve with whipped cream (or ice cream) and peppermint if desired. Serves 6 to 8. 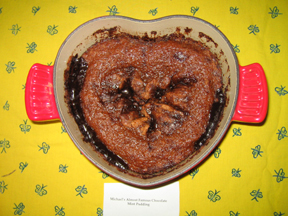 The 2006 Pudding Head samples her entry. This entry was posted on Wednesday, September 30th, 2009 at 4:00 am	and is filed under Pudding. You can follow any responses to this entry through the RSS 2.0 feed. You can leave a response, or trackback from your own site. I just gained five pounds visiting this site! LOVE the Pudding Contest poster!